Good Morning- Hope you all had a lovely weekend. I did something that I have been wanting to do for a very long time. 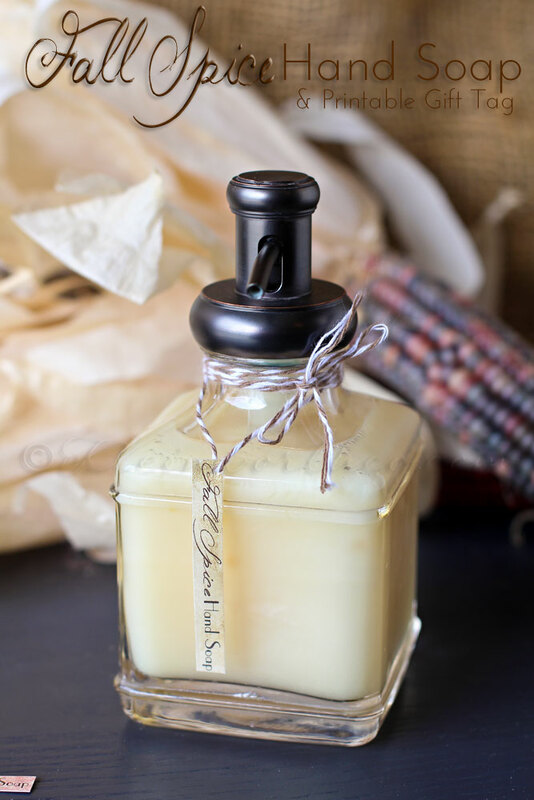 I finally made my own scented hand soap in a super easy way. You see for the longest time I would buy the Pumpkin/Fall Spice scented hand soap & lotion from Avon. I love the smell so much & I get so sad when it runs out. Well since we moved I have not really been buying Avon so I never picked some up for the season. In fact – I don’t even know if they still offer it. But now I don’t have to worry- I figured out how to make my own. I decided to make some printable gift tags for you all to download. This way if you make some & then want to give it as a gift (which I recommend) you have everything you need. Doesn’t it look pretty in this little container?? I picked it up at Target or Walmart- I can’t remember. 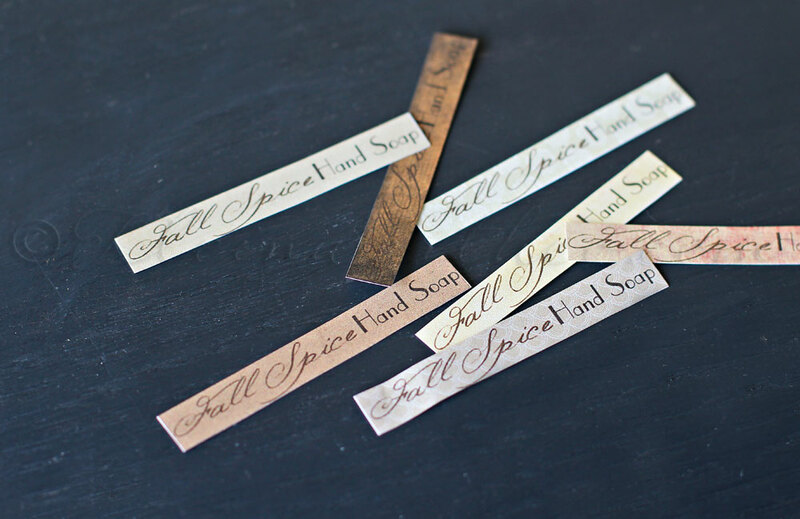 For the soap– fill your soap dispenser with your favorite unscented soap. I used Milk & Honey because it’s somewhat moisturizing. Then I added about 2 tsp of Pumpkin Spice Scented Fragrance Oil. I picked mine up on ebay for around $3 including shipping but I think you can get it at the craft store in the soap making isle. Swirl it around- and there you go. Yes- that simple & I’m kicking myself for not doing it sooner. I made several different color tags so you could choose your favorite or use them all for multiple gifts. I also made them in 2 different sizes depending on the size of your dispenser- whether it be tall or short. Download the LARGE or SMALL – whichever you like. So now let’s get on to the Project 52 photo sharing! * Post 1 photo or as many as you like each week on Mondays. * The button or text link should be present in your post- but not absolutely necessary. * Please visit some other blogs & leave some love & encouragement. * Submit the URL of your blog post – not your home page. Mm, I can smell it from here! You’re so original! Thank you Tamar- you are so sweet. You are so clever! Would be a fun gift! What a great idea Gina!! So simple, yet so beautiful! I will have to try this! Thank you! This is such a great idea, Gina. Your talent never ceases to amaze me! Thank you SO MUCH Kristen – you are so kind. Love seeing you pop by. It’s been a while since we have caught up. love it I need to learn how to make my own thanks for sharing found you through show and share wednesday have a great day following via email. that soap pump comes from Target. i looked at walmart for antique soap pumps myself before fining them at Target. all ingredients are not mention quantity? See the paragraph “For the Soap” – just fill up your soap dispenser with you favorite unscented soap & add in 2 tsp scented oil. Hope you try it. 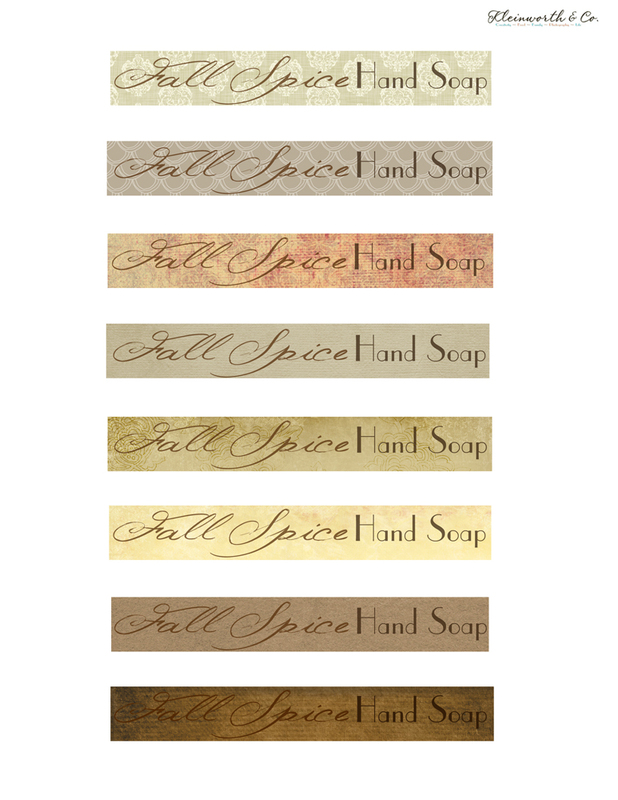 Wait, I can make any fragrance soap just by adding scented oil regular soap… game changer! Thanks for sharing at the Pinworthy Project Link Party.